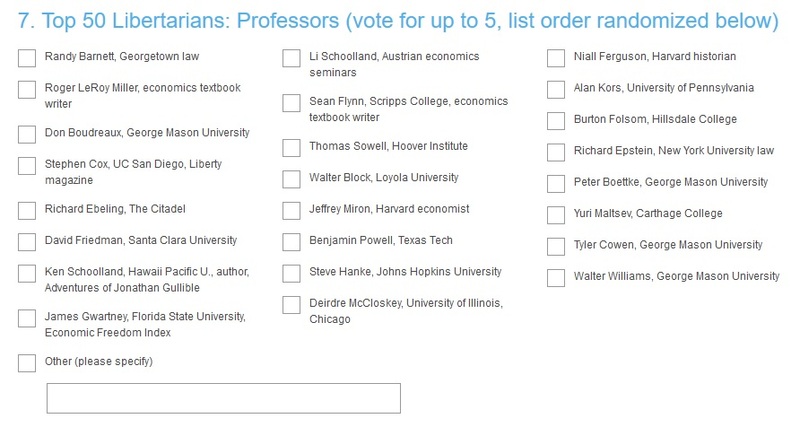 Economists are sometimes considered to be a bit odd, and the same thing is sometimes said about libertarians. And since I’m a libertarian economist, I realize that makes me doubly suspect. So when I’ve written about the desirability of market-based organ transplants (see here, here, and here), I realize some people will instinctively object because selling one’s organs is somehow distasteful and icky. Or it makes people subject to exploitation. For instance, writing for the Washington Post, Scott Carney argues that organ sales would take advantage of the poor. What would happen if the United States legalized the sale of human organs? …Whether we like it or not, we live in the era of globalization, and if the U.S. legalizes the market for body parts, there is no reason to think that international economies won’t play a role in how a patient decides to procure transplant organs. …According to the National Foundation for Transplants, a kidney transplant costs about $260,000. In the illegal organ markets in India, Egypt and Pakistan, the same procedure rings in at just shy of $20,000 — certified organ included. …The only thing stopping the typical American transplant patient from going abroad and buying an organ is the difficulty of making contact with a broker and the threat of what might happen if they get caught. …the market for human body parts is a lot like the one for used cars: They’re only worth what someone is willing to sell them for. …hundreds of thousands of people are available and willing to sell their flesh for pennies on the dollar. My view, for what it’s worth, is that I shouldn’t be allowed (and the government shouldn’t be allowed) to block a willing seller and a willing buyer from engaging in a mutually beneficial exchange. But folks like Mr. Carney think that poor people will get exploited. …it’s helpful to review what happened in the market for human surrogate babies. In the United States, it is legal to pay a woman to carry a child… Once the market was clearly defined in the United States, other countries, with looser definitions of human rights, fought for their share of the market. In 2002, India became the go-to destination for procuring a budget surrogate womb. To the surprise of no one, the Indian industry soon began to cut corners. Women were housed under lock and key in houses known to the press as “baby factories.” …Late last year, India finally outlawed surrogacy tourism after non-stop incidents and official inquiries into the surrogates’ well-being. Now the commercial surrogacy boom seems to be moving to Cambodia where regulations are still loose. So what’s his bottom line? We cannot solve our own organ shortage by exploiting the poor and helpless people on the other side of the world. I don’t doubt that there are shady people willing to exploit the poor by not giving them relevant information and/or not fully compensating them, though that’s not an argument against organ sales (just as similar periodic bad behavior by car salesmen and insurance brokers isn’t an argument against markets for automobiles and life insurance). Instead, it’s an argument for governments in places such as India to do a better job at protecting and upholding the rule of law, which is one of the few proper and legitimate functions of a state. A Wall Street Journal column by two attorneys from the Institute for Justice approaches the issue more dispassionately, noting that a market for bone marrow could save many lives. Hemeos is aimed at one of the most pressing problems in medicine: the shortage of bone-marrow donors to combat deadly blood diseases. Thousands of Americans are waiting for a lifesaving donor, and thousands more have died waiting. Marrow donors provide blood stem cells, which reproduce continuously in the patient and restore the ability to make healthy blood. …Blood is drawn from one arm, the blood stem cells are skimmed out, and the blood is returned through the other arm. Donated marrow cells regenerate quickly and fully. Despite the ease of donating, thousands of patients with leukemia or other blood-related disorders are desperately searching for donors because a specific genetic match is required. …Hemeos plans to revolutionize donor recruitment by taking one simple step: compensating donors with a check for around $2,000. As with every other valuable thing in the world, we will get more marrow cells when we pay for them. It’s Econ 101. Sounds great, right? A classic example of a win-win situation! In 1984 the National Organ Transplant Act (NOTA) made it a federal crime to pay donors. Unlike plasma, sperm and egg donation—for which compensation is legal and common—paying marrow donors remains illegal. The result? Shortages, waiting lists and unnecessary suffering. Fortunately, the courts have stepped in. Ms. Flynn has three girls with Fanconi anemia, a genetic disorder that causes marrow failure. Wanting to do everything to save her girls and others, Ms. Flynn, along with several cancer patients in need of bone marrow, sued the Justice Department to end the ban on compensating marrow donors. A federal appeals court ruled in 2011 that because Congress expressly said that NOTA wouldn’t affect compensation for blood donation, …Congress couldn’t have intended the law to restrict compensation for marrow donations using modern, nonsurgical techniques. But, still, government is government. But a year after Ms. Flynn won her case, the Department of Health and Human Services announced that it might enact a regulation effectively nullifying the court’s ruling—and thus Ms. Flynn’s victory. …And while HHS fiddles, patients die. Thousands of Americans have died awaiting a marrow transplant since HHS embarked on this needless diversion. How many could have been saved? And of those still alive, how many could have received a transplant faster and with a better-quality donor? This is a lesson in how a faceless, lumbering bureaucracy smothers innovation and optimism. Here’s a very powerful video from IJ on this issue. It’s hard to watch that video and think about what you would do if your children faced the risk of death. Sally Satel of the American Enterprise Institute adds her two cents, writing on kidney sales from the unique perspective of being someone who has received two kidneys solely because of human kindness. I am almost obscenely lucky. Within a 10-year period, two glorious women rescued me from years of grueling dialysis and a guarantee of premature death. …tremendous generosity allowed me to live many years in peace instead of constant worry. …I understood the general reluctance to donate. After all, giving a kidney is by no means risk-free (roughly a 0.02 percent, or 2 in 10,000 mortality rate, a 3–5 percent rate of serious complications, and perhaps a 25 percent chance of minor complications). Also, some people want to “save” their kidney lest, say, their own child needs it. Then, too, a lot of people are simply put off by surgery, and some handful—no one knows the extent of this group—can’t afford time off and lost wages. Of the 120,000 people waiting for organs, 101,000 are waiting for kidneys. And for those who aren’t as lucky, Sally points out that current policy puts them in a very difficult position. My transplants were a matter of private policy. My friends saved me—out of empathy, out of principle, out of affection. I’m beyond fortunate for them, because our public policy is failing far too many people who need organs. Twenty-two people die each day because they cannot survive the wait for an organ; 12 of those die from lack of a kidney in particular. The core of the problem is that prospective donors are legally required to relinquish an organ in the spirit of “altruism.” Despite the risk they take on, they are not allowed to benefit materially in any way. This mandate is part of the 1984 National Organ Transplant Act, the law that established the national system of organ procurement and distribution. Any exchange of an organ for any sort of “valuable consideration,” is a felony punishable by up to five years in prison and/or a $50,000 fine. Indeed, current policy is causing people to needlessly die. The original law was intended in good faith. The point was to prevent a classic free market where only wealthier patients could afford to buy organs; it also sought to avert the scenario where poor donors were the “suppliers” for the well-off. …But more than enough time has now elapsed to conclude with certainty that an altruism-only system is sorely inadequate. And as in so many realms, it is the poor (especially poor minorities) that have suffered the most because of the deficit. They are less likely to be referred for transplant, more likely to die on dialysis, and less likely to receive an organ from the national pool even when they are referred. One lawmaker is trying to push policy in the right direction. In May, Pennsylvania Rep. Matt Cartwright introduced a bill called the Organ Donor Clarification Act of 2016. Its goal is to permit study of the effect of rewarding people who are willing to save the life of a stranger through living donation: Not through a free market with direct cash payments… Rather than large sums of cash, potential rewards could include a contribution to the donor’s retirement fund, an income tax credit or a tuition voucher, lifetime health insurance, a contribution to a charity of the donor’s choice, or loan forgiveness. Only the government, or a government-designated charity, would be allowed to distribute these benefits. (The funds could potentially come from the savings of stopping dialysis, which costs roughly $80,000 a year per person.) In other words, needy patients would receive kidneys regardless of their ability to reward donors out of their own pockets. …The donors’ kidneys would be distributed to people on the waiting list according to the rules now in place. Congressman Cartwright’s proposal obviously wouldn’t create a genuine free market. But it would allow compensation to become part of the equation. So his proposal presumably would save lives compared to the current system. Oh, by the way, it’s worth noting that criminalization of organ sales doesn’t fully stop the practice. Other nations step in, often with policies that are disgusting. …one of the most horrific markets operating today: Communist China’s selling of organs harvested from prisoners of conscience. Ten thousand “transplant tourists” travel annually to communist China, where they pay top dollar to get organs transplanted on demand. …Free countries may not be able to stop this horrific practice, but they could reduce the demand for these organs by allowing free people to exercise the choice to sell their organs. Currently, free countries rely only on altruism, which has resulted in severe shortages of organs and black markets. In other words, the policies advocated by Mr. Carney (the first story cited at the start of this column) would enhance the profitability of the Chinese organ-harvesting system. That doesn’t seem like a good outcome. 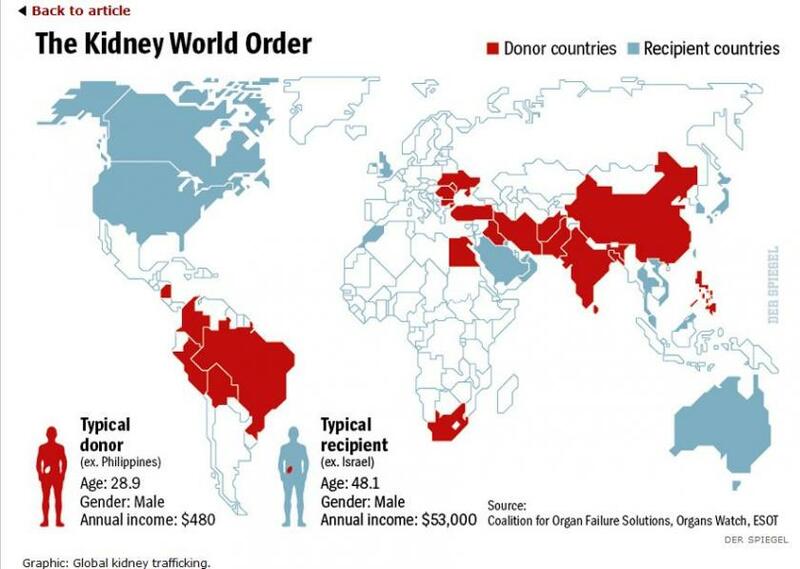 Here’s a map showing how the kidney trade works right now, with the underground economy playing a big role. My bottom line is that poor people would get more money and have more legal protections if the system was fully legalized and operating above ground. P.S. When I wasn’t busy causing trouble in college, I would sell my plasma twice weekly. The $15 I received from the medical company was sufficient to cover my food budget. They exploited me and I exploited them. I don’t understand why some people are hostile to libertarians. After all, our philosophy is based on the notion that we want government to be limited so it is less likely to reach into your wallet or your bedroom. At the risk of oversimplifying, libertarians think it’s okay for government to safeguard life, liberty, and property from force and fraud, but we’re very leery about giving additional powers to the government. Seems like a reasonable governing philosophy to me, but some people object to being treated like adults and they lash out with very silly attacks on libertarianism. Consider this article in Slate, which makes it seem as if libertarians are hypocrites if they accept – and express appreciation for – assistance from firefighters. …an Okanogan, Washington man named Brad Craig thanks firefighters for saving his home. It’s a nice moment, though if you look closely you’ll notice that Craig happened to be wearing a t-shirt that given the circumstances is quite ironic… The shirt says “Lower Taxes + Less Government = More Freedom.” …10 different government organizations are mentioned in the AP story about the large-scale coordinated response that worked to Craig’s benefit. Wow. I’m not sure whether the author is malicious or clueless, but this is remarkable. He’s basically saying that if you want less government, you must be a hypocrite if you support or benefit from any government. Which is the same as me asserting that leftists are hypocritical to buy I-Phones because their support for more government means that they therefore must favor total government and no private sector. 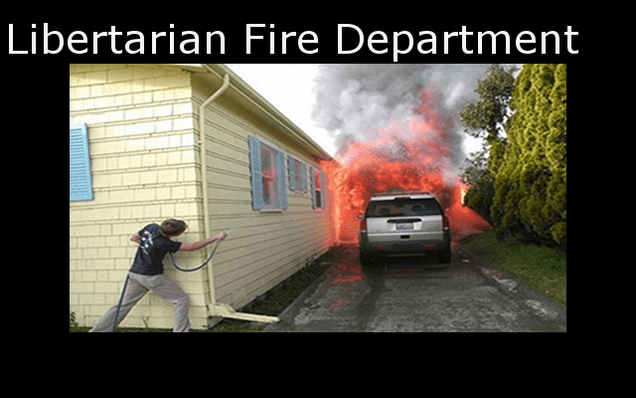 There are, of course, some libertarians who persuasively argue that we don’t need government fire departments. And some who even argue that we don’t need any government. 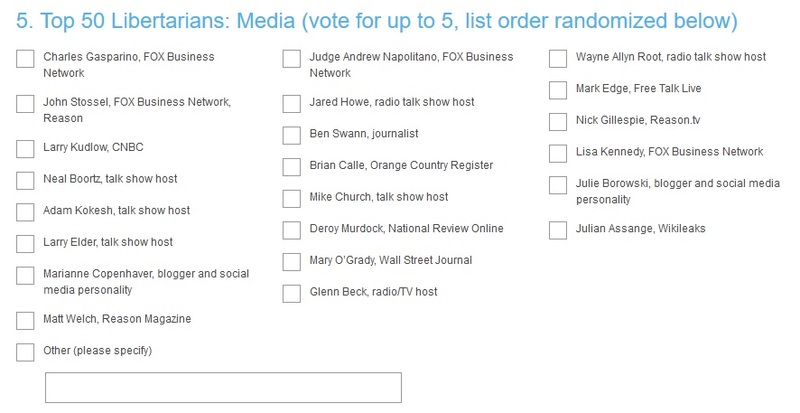 But even if Brad Craig (the guy with the t-shirt) was in one of these categories, that doesn’t make him a hypocrite. Many poor and middle-class families would like a voucherized education system so they could afford to send their kids to private schools. In the absence of such a reform, are they hypocrites for sending their kids to government-run schools? Here’s another example. The government today takes money from just about all of us to prop up a poorly designed Social Security system. Are the workers who have been coerced into that system hypocrites if they take Social Security benefits when they retire? Jim Treacher of the Daily Caller also weighed in on this topic. Here’s some of what he wrote. I can express a desire for less government interference in my life without rejecting the need for firefighters. Or police, or roads, or Stop signs, or whatever. I understand that it’s actually possible to advocate individual liberty while still admitting the need for government. People have been saying such things for hundreds of years. Let’s close with this look at how libertarians are the reasonable middle ground between two types of statists. I don’t fully agree with all the characterizations (many leftists favor corporate welfare and are not tolerant of other people’s personal choices, for instance, while there are folks on the right who aren’t very committed to economic freedom), but it’s worth reviewing. If you want to figure out where you belong, there is a short way, medium way, and long way of answering that question. And while I don’t want put my thumb on the scale as you take these tests, I’ll simply note that decent and humane people tend to be libertarians. P.S. 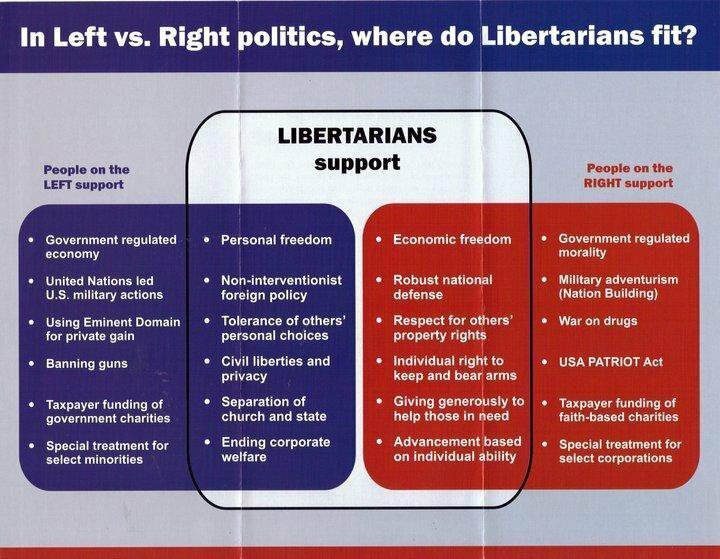 Here’s a more scholarly look at the difference between libertarians and conservatives. P.P.S. And here’s my take on why there aren’t any pure libertarian societies. P.P.P.S. Here’s my collection of libertarian humor. I’m very depressed that my beloved Georgia Bulldogs lost to the South Carolina Gamecocks. So instead of writing about a serious topic, we’re going to enjoy some laughs today by reviewing some new anti-libertarian humor. I’m a libertarian, of course, as are all decent and humane people. But I appreciate clever humor, even when I’m the target. This video about Somalia being a libertarian paradise, for instance, is an excellent example of political satire. It takes a stereotype and milks it for some great laughs. 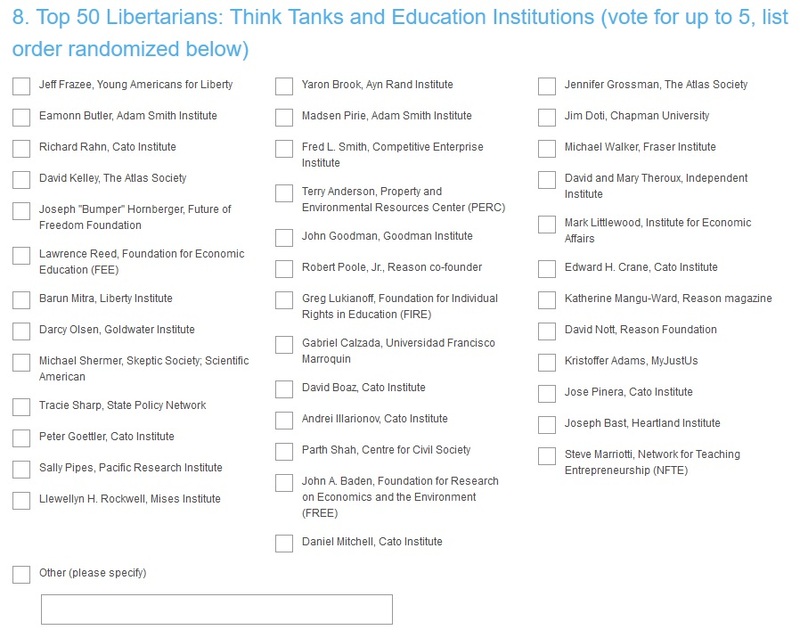 I also have to tip my proverbial hat to the person who put together this image of libertarian utopia. It’s misleading, of course, since libertarians either have no problem with local paramedic services or they believe in private contracting of such services. But for purposes of humor, this image is great satire since it combines the stereotype of libertarians being all about profit and the stereotype of no basic government services in a libertarian world. If you liked the above image, here’s some additional anti-libertarian satire that is similarly amusing. 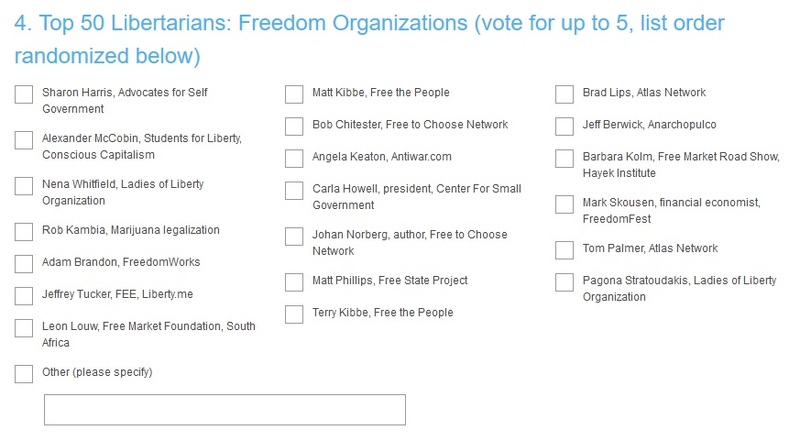 Alleged libertarian views on fire departments can be seen here and here. Now let’s look at some anti-libertarian humor that falls flat. As I suggested above, political humor effective is effective when it seizes on something that is true and then applies that stereotype to an absurd situation. But this next image makes no sense. It implies that there will be more violent, drug-related crime in the absence of prohibition. But there’s lot of violence surrounding marijuana and other drugs precisely because they are illegal and that creates lucrative opportunities for sellers in the black market. 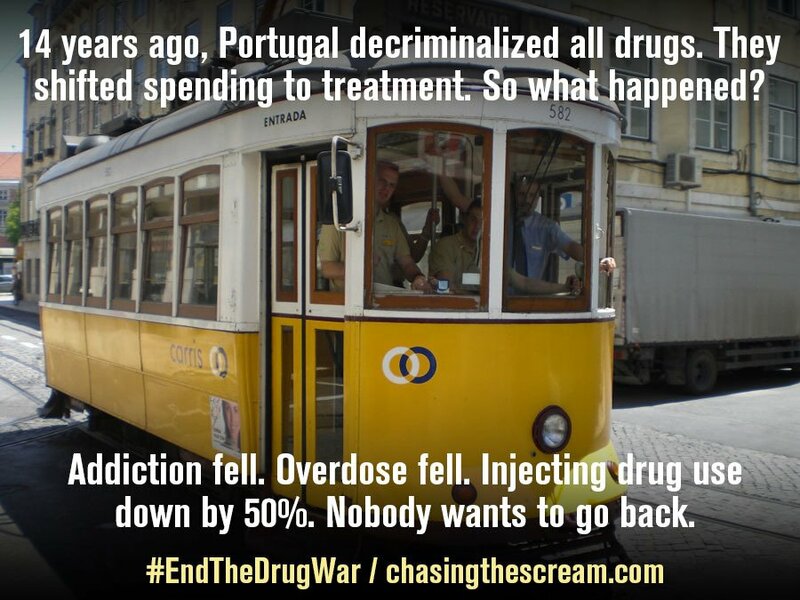 Simply stated, if you end drug prohibition, then criminal gangs and cartels will lose their markets. If you don’t believe me, ask yourself why there was lots of violence during the Al Capone era in the 1920, whereas you don’t see Heineken and Anheuser-Busch engaging in shoot outs today. Or let’s look at the issue from another perspective. What if the lifestyle fascists banned cigarettes. Right now, with cigarettes being legal, there’s no violence between Philip Morris and R.J. Reynolds. But imagine what would happen if cigarettes went underground and their distribution was controlled by thugs? Of course there would be violence. I’m not trying to turn this post into a lecture on drug prohibition, so I’ll stop here. But I did want to expose the intellectual vapidity of the person who put together the second image. By the way, some of my libertarian friends complain when I share anti-libertarian humor. I have three responses. 1. I share lots of humor mocking statists and regular readers know that advocates of bigger government are my main targets. 2. Self-confident people should have the ability to laugh at themselves and libertarians (thanks in part to Obama) have ample reason to be confident of their ideas. 3. I’m more than happy to share pro-libertarian humor. The only problem is that I’ve only found a handful of examples. So feel free to send any new material my way. All (good) political humor is appreciated. 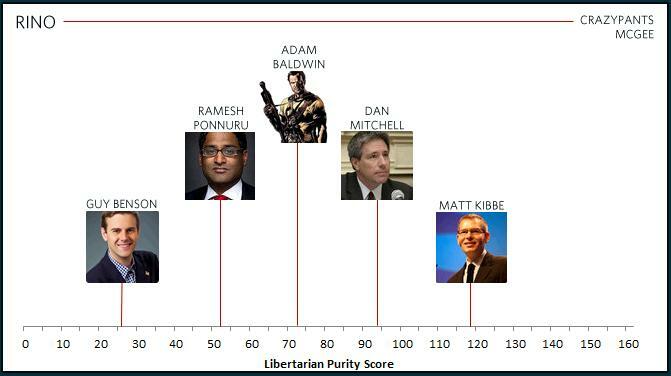 Early this year, I took a libertarian purity test put together by Professor Bryan Caplan at George Mason University. The good news is that I got a 94. Sounds like a solid A, right? Well, the bad news is that the test wasn’t on a 0-100 scale. The maximum grade was 160, so it seems I’m just a big-government squish! In my defense, that still ranks me above the vast majority of people in Washington. That being said, I’m jealous that my former grad school colleague Matt Kibbe (now head of FreedomWorks) got a higher score. Here’s a summary of the test put together by Ben Domenech. So what’s the real story? 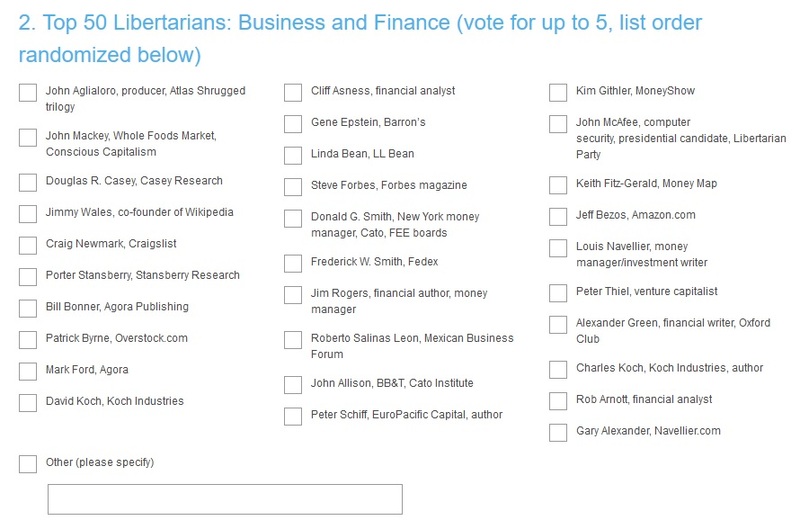 Am I “a high priest of light tax, small state libertarianism,” as I was described by a left-wing British journalist? Or am I a closet statist, as suggested by a critic from Canada? I think I belong on the former category, but I have to confess that I just took a “social attitude” test that was sent to me by a friend in London and the results are a bit disconcerting. I was horrified to learn that I got a score of 18.75 for socialism. To be sure, I don’t know if that’s 18.75 percent, or 18.75 on a scale of 0-1000. Regardless, I’d much prefer to get a score of zero on any measure of coercive collectivism. And what’s the deal with the 40.625 for tenderness? Makes me sound like some sort of new-age wimp who goes around trying to instigate group hugs. Last but not least, what’s “radicalism”? Is it simply a measure of being outside the mainstream? Without any guidance, there’s no way of interpreting that score. My two cents, for what it’s worth, is that the analysis part of this exercise needs some work. But feel free to take the test and add your two cents to the discussion. I’ll simply state that I can’t be a squish if my policy heroes are people like Barry Goldwater, Ronald Reagan, and Margaret Thatcher. 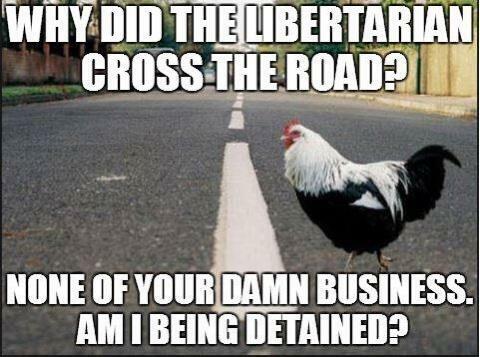 Why Did the Libertarian Chicken Cross the Road? The good thing about being a libertarian is that you are motivated by freedom, which is a very noble principle, and you have lots of evidence on your side, whether the issue is economics or personal liberty. You can’t afford to be smug, of course, since it’s still a big uphill battle to convince politicians not to engage in plunder. But at least you can sleep soundly at night knowing that you’re on the side of the angels. And that even means you have self-confidence about your ideas and you can laugh when someone puts together some clever anti-libertarian humor. Here’s the latest example, sent to me by a TV journalist. What makes this funny is that libertarians are sometimes quick to defend their rights, even when nobody’s trying to take them away. Which is why we sometimes get pigeonholed as being weird, like the family in the lower left of this poster, or paranoid, like the guy in the #8 spot of this poster. But let’s be thankful that there are some libertarians willing to raise a stink about government even if the rest of the world thinks we’re a bit odd. As we’ve seen dozens of times, most recently with the IRS and NSA, bureaucrats and politicians have a compulsive tendency to grab more power and make government more intrusive. I started yesterday’s post with a mother-in-law joke, so I’ll end today’s post by mentioning the fable of the frog that gets put in a pot of water and doesn’t jump out because the temperature feels comfortable. But then the heat is slowly raised and the frog no longer has the energy to escape when he finally figures out he’s being cooked. 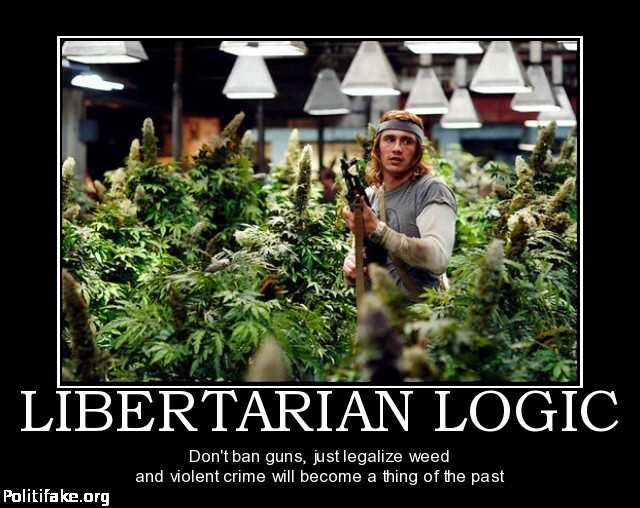 Well, libertarians are the ones who loudly complain when the government puts us into pots.